Fawaz Concept: The Name Behind The Great Artworks For Your Favourite Entertainer. The entertainment industry is made up of so many different individuals with unique skills and talents. There are the bloggers, events organizers, sound engineers and also fashion designers. One of such people making background impact is Graphic Designer Fawaz Concept. Fawaz Concept has been in the industry for a while now. He is the one responsible for most of the artwork you see and love from your favourite artiste. His work is very extraordinary and it has helped in one way change the image of the now big artiste because of his “Crazy” work. Being responsible for amazing artworks for Sarkodie, R2bees, Strongman, Stonebwoy, Shatta Wale and a Host Of other artiste. Fawaz needs to be projected and celebrated for his impressive works. KobbyKyeiNews.com is using it’s influence to allow the whole of Ghana applaud the genius of the great graphic designer. Mainly to let you know that the industry which you love is not only made up of entertainers, there are those who are at the background who work tirelessly to make the brand of your favourite entertainer world class. These people need to be appreciated and celebrated. Fawaz Concept is one of such people and I celebrate him. He has recently shared an amazing artwork he did for Nigeria’s Starboy Wizkid on his social media page. 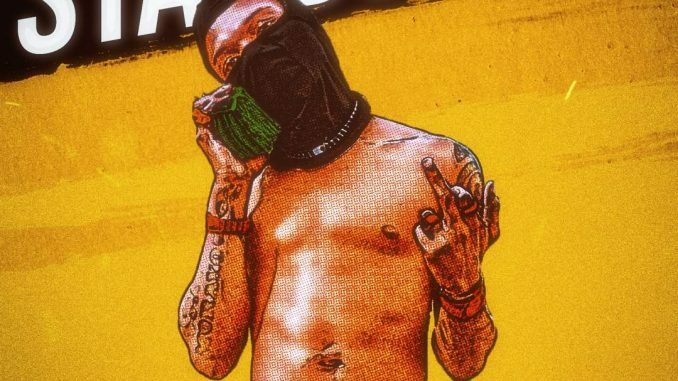 Wizkid was also seen using the artwork as his Social Media profile.